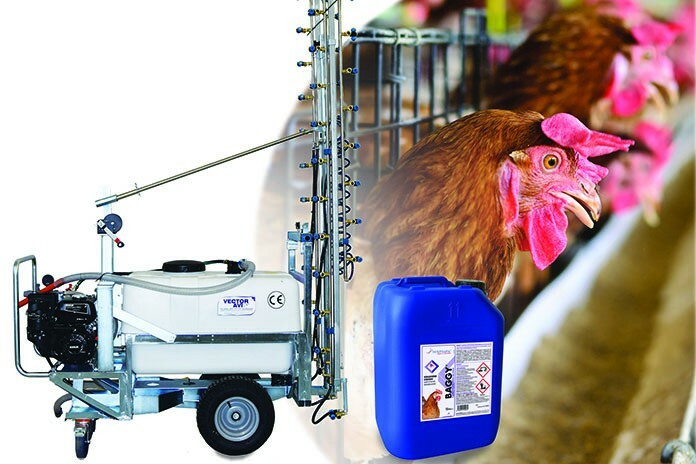 Dermanyssus gallinae (poultry red mite) is counted amongst the major pitfalls, if not the largest, of the poultry industry worldwide. In addition to causing a constant state of malaise in hens, which in the most dramatic cases can worsen until mortality results, red mite weighs heavily on flock economics. 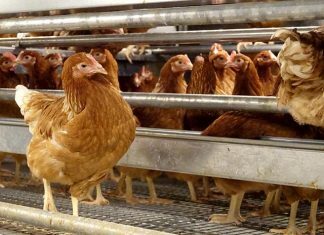 It causes lower egg production, egg quality suffers and mortality increases. While numerous attempts have taken place to try to curb this scourge, poultry farmers today still find themselves asking for concrete support in order to preserve their farms. Cage laying farms are a popular location for red mite and among the reasons for the continuous failure in stemming the development of mite infestation is the hygienic conditions inside the facilities. It goes without saying that the continuous accumulation of dust between the cages promotes the development and multiplication of this insane parasite. The on-farm organic matrix available creates an ideal location for the building of their nests. It should also be noted that one of the reasons for the ineffectiveness in the direct fight against Dermanyssus is the indiscriminate use of insecticides that often leads to abuse of chemical formulations which cause irritations to the birds, can pose the risk of contamination of the food chain and can in the end create mites that are resistant to the most well-known active ingredients. Most of the time, the dust and coarse material present on farms either limits or blocks completely the effectiveness of pesticide treatments. Accepting this logic it is therefore essential that, when trying to establish an effective programme against red mites, preventative hygiene measures are put in place with regard to the cages such as removing dirt and organic material that mites find inviting. Such action exponentially increases the vulnerability of the settled colonies of mites, who find themselves deprived of their nests and shelter. Working on the facts outlined above, Newpharm has distinguished itself in recent years with a plan of action in this struggle against red mite infestations that combines direct and indirect intervention. A stand out feature of the intervention programme is Baggy®, a balanced solution of surfactants able to thoroughly and hygienically cleanse surfaces. Applied directly onto the cage surfaces (birds can be present) the degreasing action of surfactants removes dirt and indirectly rejects the colonies of mites. On sanitized surfaces, the mites have less chance of engraftment and proliferation. Applied with due diligence, focusing on the deeper points between the cages and under feeders and perches, one notes in a few hours the rapid disintegration of the organic material. 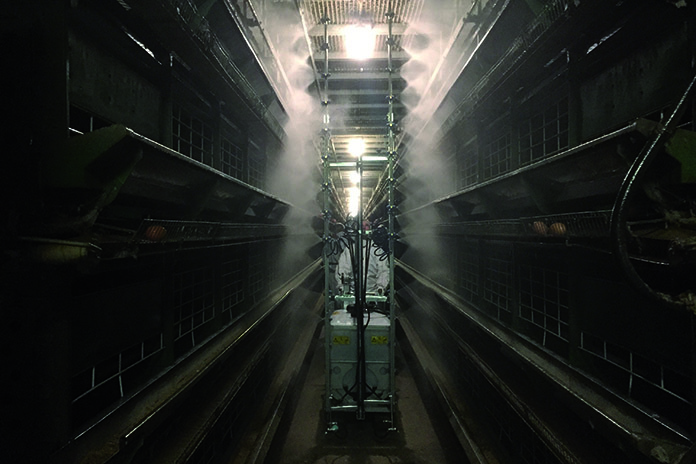 To facilitate application, Newpharm has designed Vector-Avi® Plus, an innovative piece of machinery, equipped with vertical bars, which thanks to its modularity and flexibility is adaptable to all situations and structures and also comfortably reaches the highest of cage layouts ensuring maximum spraying penetration and optimization of application times. 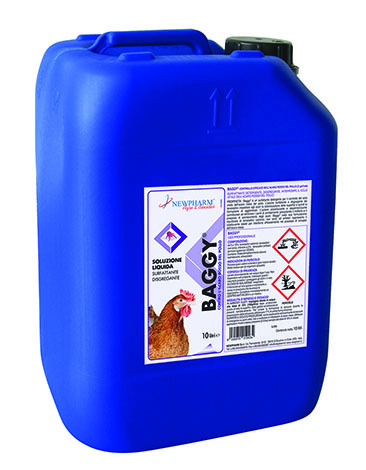 Baggy® not being harmful to the chickens (or animals in general) can be applied easily at any stage of the production cycle. The goal of Newpharm is to provide full and constant support to poultry farmers by supplying efficient, safe, and veterinary approved products. Baggy® is one of the products in the range of Newpharm control solutions, the most comprehensive ever, designed to ensure maximum sustainability and efficiency in both environmental and economic terms. It joins the already recognized solutions such as Baggy® Plus, Newcidal® Sil, and Newcidal® Plus. Producing effective solutions that create a defence against infestations that cause harm and damage to livestock, the farm staff and the environment is the Newpharm mission. The specialized technicians at NEWPHARM are available for further information and personalized advice.